Firefighters exposed to injury and health risks on the job can rely on us to defend their rights. In 2017, the State of Ohio joined the majority of U.S. states and passed presumptive cancer legislation for all firefighters (professional and volunteer). The attorneys at Connor, Kimmet & Hafenstein LLP were involved with pushing for the passage of this legislation and have experience with handling presumptive cancer claims through the Ohio Workers’ Compensation system. The new law, Ohio Revised Code Section 4123.68(X) became effective on April 6, 2017. This section creates a presumption, if specific qualifications are met, that any cancer contracted, is job related. This legislation shifts the burden to the employer which may be rebutted under specific circumstances. If the employer successfully rebuts the presumption, the burden then shifts back to the firefighter to prove, by a preponderance of the medical evidence, that the diagnosed cancer was caused by the occupation. Cancer contracted by a firefighter: Cancer contracted by a firefighter who has been assigned to at least six years of hazardous duty as a firefighter constitutes a presumption that the cancer was contracted in the course of and arising out of the firefighter’s employment if the firefighter was exposed to an agent classified by the international agency for research on cancer or its successor organization as a group 1 or 2A carcinogen. 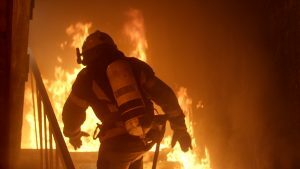 (a) There is evidence that the firefighter’s exposure, outside the scope of the firefighter’s official duties, to cigarettes, tobacco products, or other conditions presenting an extremely high risk for the development of the cancer alleged, was probably a significant factor in the cause or progression of the cancer. (b) There is evidence that shows, by a preponderance of competent scientific evidence, that exposure to the type of carcinogen alleged did not or could not have caused the cancer being alleged. (c) There is evidence that the firefighter was not exposed to an agent classified by the international agency for research on cancer as a group 1 or 2A carcinogen. (d) There is evidence that the firefighter incurred the type of cancer alleged before becoming a member of the fire department. (e) The firefighter is seventy years of age or older. The presumption described in division (X)(1) of this section does not apply if it has been more than fifteen years since the firefighter was last assigned to hazardous duty as a firefighter. The Ohio BWC requires the claim to be filed with the First Report of Injury; C-265; and medical diagnosis/confirmation of the cancer diagnosis.